Ah, that defining moment in childhood. The first bicycle. 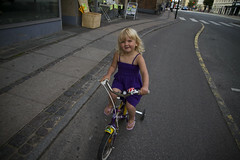 Lulu-Sophia is turning four shortly and she got her first bicycle last week. 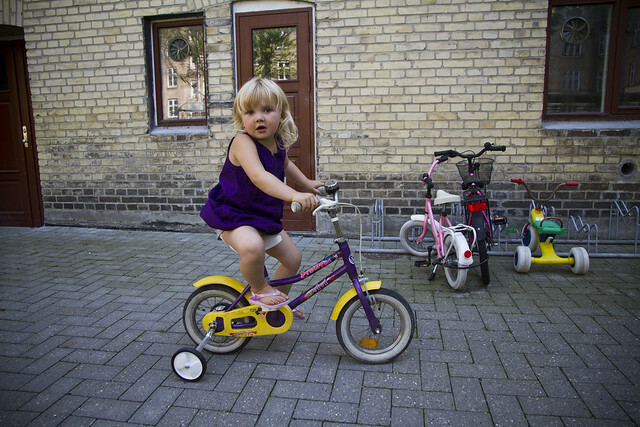 Now, she is a Copenhagener so it's not like she hasn't had any bicycles or tricycles in her life. There are always loads of bicycles in the backyards of Copenhagen flats for use by anyone. Nevertheless, there is a sense of pride in getting your VERY OWN BICYCLE, and Lulu is no exception. 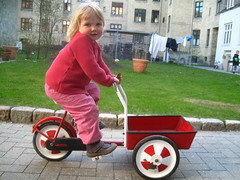 She has taken a fancy to this little cargo bike in the backyard (cargo bike culture starts early here) and loved riding around on it. Then she noticed the bicycle on the right, parked in one of the many bike racks, and every time she sees it, she says, "Daddy, THIS is the bike I want..." I explain to her that it's a bike for a nine-year old so she can have one when she's bigger. 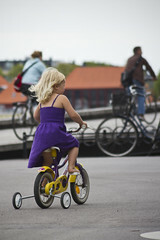 (There are, by the way, many different brands in Denmark that make pint-sized upright bikes). That was when I realised that she was ready for a bicycle to call her own. As luck would have it, a few bicycles were left in the garbage room and one of them was perfect for her. She spotted it right away. Vintage bikes are IN, so it was appropriate that the bicycle is about 15-20 years old and in excellent condition. The text on the frame reads Pretty Girl, so that is perfect, too. 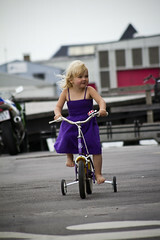 Balance bikes are all the rage at the moment and they are said to be great at teaching kids how to ride. Lulu has tried them out but in her case, they didn't fit her personal needs and abilities. So Daddy went on a search for some training wheels. I went to a couple of the bike shops in my neighbourhood and finally found a pair of training wheels that fit this vintage bike. In a flash, Lulu was up and riding. Nice and easy at first, around our backyard, with a proud smile on her face. Priceless. She went from strength to strength in no time and I soon realised that the bicycle was going to have to follow us around. 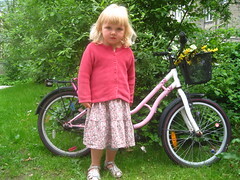 Later that first day, she insisted on riding her bicycle down to the shops with us. 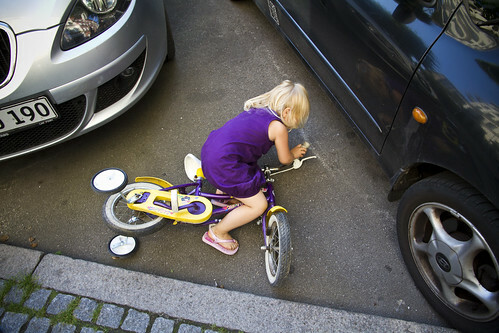 It was on that first day that she had her first bike "accident", another milestone in childhood. One of the training wheels went off the curb and she toppled over, getting an ow on her foot. She got, of course, all the love and comforting she needed, although Daddy and big brother congratulated her on her first 'crash'. Upon seeing how proud we were of her, she ended up smiling proudly, too. The next day we went down to the harbour to meet a journalist and photographer for an interview. Sure enough, she insisted on bringing her new bicycle in the cargo bike and we rode around by the harbour. It's thrilling to see that sense of personal pride on a child's face when riding their first bicycle. I remember that feeling from my childhood like it was yesterday. Later that day we headed back to our 'hood for an ice cream. Lulu wanted to ride her bike home from the ice cream shop. It is summer holidays at the moment in Denmark and the nation basically shuts down for three weeks. Everyone vacates the city for summer houses or trips abroad so there was ample room on the cycle tracks. The look on her face when I told her that she could ride, like a big girl, on the cycle track all the way home warmed my heart. It was slow going, but she did well, helped along the way by me and her big brother, Felix. Growing up has many milestones. The bicycle evolution is just one of them. But it is arguably one of the loveliest. Mikael, you have done may wonderful posts on this site. But this is one of your best. I could actually feel the pride and love you have you Lulu. Sorry, I couldn't even type that hemet crap without cracking myself up. Beautiful post, beautiful photos and beautiful daughter. Thank you for sharing with us. Good to see that cycle chic is trans-generational. Welcome to Lulu-Sophia in the magical world of riding ! 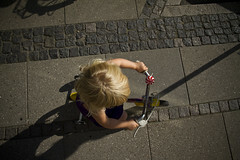 Very lovely post Mikael - reminds me of teaching my son to ride. At 2-1/2yrs he was big enough (finally) to ride a 12" wheeled bike and a few years later the training wheels finally came off! I was so proud to see him both pedal the first time and even more proud when he finally freed himself from the training wheels. Thanks for the post, you made my day! Lulu is always an adorable sight and even more so on a bicycle. 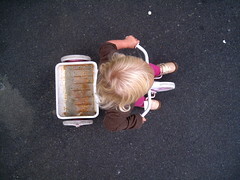 I am passing many parents these days out teaching their little ones how to ride, many sans training wheels. I always stops to give them a good cheering on, especially when they take that spill, reminding them that I still have them even on my big girl bike. I usually get a grateful smile and "thank you" from their parents. The bicycle is certainly a right of passage. That was a lovely post M! I am going through my own bicycle rites of passage with my girls this summer, getting them riding sans training wheels, and totally relate. Thank you! 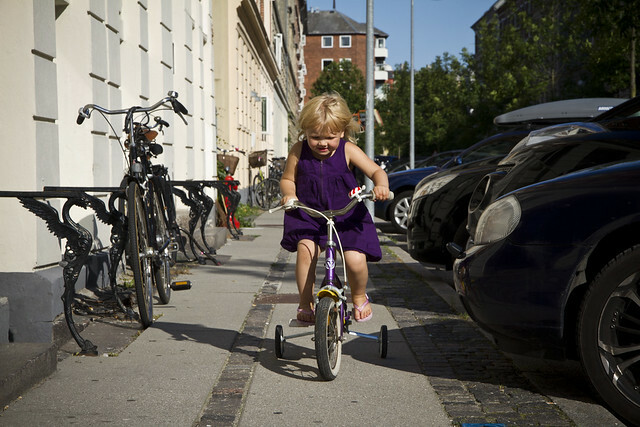 Mikael, as soon as she get's her skills on pedaling right, get rid of the training wheels. Help her for couple of minutes, and you'll be amazed by how fast she gets her balance right. I believe that the longer they stay with the trainning wheels, the harder it gets. My oldest one learned when he was 4, and it took him like 30 minutes. The youngest one, learned when he was just 3 - it took him 5 minutes! The hardest part then, is to learn the "take off". Once they are moving, it's easy to keep the balance. But they need extra help in the start. What a lovely post! Reminds me of my father teaching me how to ride. And what a chic purple dress! Sends my down memory lane, +-20 years back when I got my first bike with training wheels, it was a tru sign that I was finally a big girl. Maybe I'm a little late to comment on this post, but I just found about your blog today. Your daughter is really cute! I'm a cyclist's daughter and a cyclist myself. Your post reminded of my first bike. I don't recall my age at the time, but I believe I was somewhere between 3 and 5 years old, and my dad had an old bike that belonged to my older brother in the shed in the back of our house. He rescued it, fixed and painted it himself and gave me for christmas. Was the best gift I got ever. My parents couldn't get me away from it for weeks! And to this day I absolutely LOVE bikes (I'm 25 now). I was born and raised in Brazil, and currently live here, but my dad is from Denmark (Fredericia) and I got the chance to visit Copenhagen a few times, hope I can go again in the next years. Thank you for sharing her first ride with us. I love this! Especially the part about Felix helping her, too. My big brother taught me to ride a bike when we were kids!